This green bean casserole is very good and a perfect way to enjoy those green beans put away in the freezer from last years garden. Of course, it is just as delicious with green beans bought from the grocery store. It is also nothing like the more famous holiday green bean casserole, this one is not too salty or processed, it is fresh and delicious! Green Bean Cobbler, AKA, the other green bean casserole! Place green beans in a mediums size pan, add water and a dash of salt, bring to a boil, reduce heat, cover and cook gently until just tender. Do Not Over Cook. Drain well and set aside. While the green beans are cooking, saute the garlic OR onion in the butter, when done set aside. Combine sour cream, flour and salt, and pepper to taste. Spoon over the green beans and stir together gently. Add the garlic (or onion) to the green beans, stir in the sour cream mixture. Place the green beans into a 2 qt. casserole, cover with the grated cheese and then the breadcrumbs. Lightly sprinkle the bread crumbs with a touch of garlic salt. Bake 25 minutes or until top is brown and the sour cream mixture is bubbly. Here are more green bean recipes you might enjoy! Cobbler! It is the perfect name for this, even though I generally think sweets. I think we should reclaim cobblers for savory foods like this! Thanks for sharing on the Waste Less Wednesday Blog Hop! I agree, cobblers can also be savory! I have made both versions, and this is a great green bean recipe to have around. Thanks for stopping by. Oh my sons would love this dish, I'm pinning it. This would be a fun thing to try as I have had the other green bean casserole before and I always thought that there should certainly be a way to make it a bit healthier. This looks like just the recipe for it! This is really tasty, I am thinking a few mushrooms at holidays would be perfect! 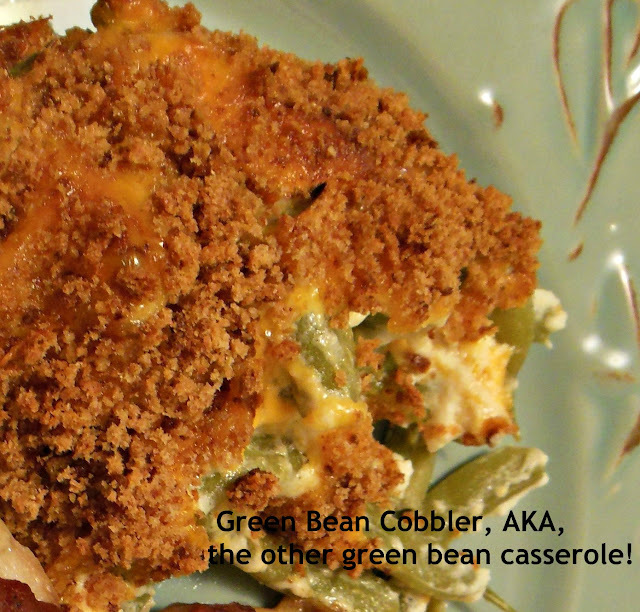 I don't think I have ever come across a green bean cobbler! Looks delicious! I have only eaten sweet cobbler but not savoury ones, this looks really good! I love your recipe, I am looking forward to making this. Hope you are having a great day and thanks so much for sharing you awesome post with us at Full Plate Thursday. Looks so good! Thanks for sharing on the What's for Dinner link up! Oh.My.Goodness! My family would LOVE this! I'll have to try it out soon! Thanks for sharing on the Homestead Blog Hop! I think you will enjoy it, we have made it twice now. This looks so much better than the traditional one everybody make. Thanks for sharing the recipe. Do you trim the green beans before cooking them ? Please feel free to prepare the green beans in your favorite manner.